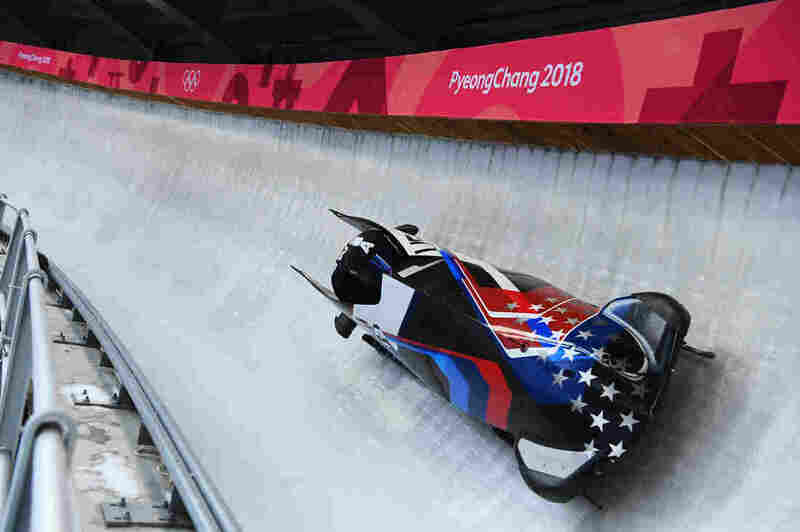 'More Than War Fighters': Active-Duty Athletes Compete In Olympics Bobsled And Luge : The Torch Sgt. Nick Cunningham, a bobsledder, is one of seven U.S. service members competing in Pyeongchang. "They told me, 'Go win medals for this country,'" he says. "And that's my job at this moment." Sgt. Nick Cunningham speeds down the track during men's bobsled training on Friday. He is one of seven U.S. service members competing in Pyeongchang. "They told me, 'Go win medals for this country,'" Cunningham says. "And that's my job at this moment." Nick Cunningham grew up far from the snow in Monterey, on California's central coast. He ran track at Boise State University. None of that hinted at the route he would take after graduation — trying out for the U.S. bobsled team. "I figured it would be a graduation gift for myself to kind of do something that's outside the box, outside my comfort zone," said Cunningham, 32. "Just try something none of my friends could ever say that they tried out for. And so I went and tried out. And 18 months later, I went to my first Olympics." That was eight years ago in Vancouver, Canada, where Cunningham competed in the two- and four-man bobsled events. After that, he did something else outside the box. Cunningham joined the New York Army National Guard. He's now a sergeant and part of the Army's World Class Athlete Program (WCAP), an elite group of soldiers who have unique orders. "They told me, 'Go win medals for this country,'" Cunningham said. "And that's my job at this moment." Cunningham is competing in Pyeongchang — his third Olympics — as a driver in the two- and four-man bobsled events. 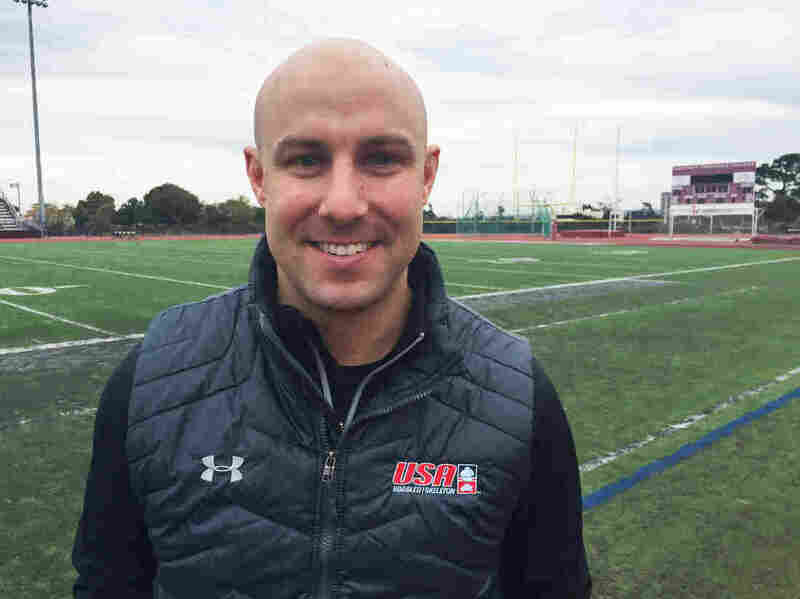 He's one of seven soldier-athletes on the U.S. Winter Olympic team. Four are competing in bobsled and three in luge. The Army's World Class Athlete Program accepts soldiers who show they can compete at the elite level of Olympic or Paralympic sport. They undergo basic training and advanced individual training like every other soldier. After that, winter athletes head to Lake Placid, N.Y., and the summer athletes go to Fort Carson, Colo.
"I think the biggest thing about the program is it affords you the time," says Col. Sean Ryan, the WCAP director of communications and a coach for the program's distance runners in Fort Carson. "But with that time comes the responsibility to maintain your proficiency in that sport, and be eligible to make an Olympic or international team. If you don't do that, you get released from the program." Cunningham trains at Monterey Peninsula College. He's competing now in his third Olympics. WCAP became a formal program in 1997. But active duty soldiers began competing in the Olympics long before then. In 1912, the Army started sending soldiers to compete in equestrian events. Today soldier-athletes compete in sports ranging from track and field to boxing and taekwondo. Since 1948, they have won 118 medals in the Olympic and Paralympic games. "That's what we are looking for," Ryan says. "When they raise the flag and play the anthem, we want it to be the United States anthem — and that's what we want, our soldier with their hand over their heart with our flag being raised. That's the mark of success." The program is financed by a mix of government funds, fundraising and private sponsorships. "We want to show that we're more than war fighters," Ryan says. "These soldier-athletes are incredible. So I think it just goes to show you how well-rounded the U.S. Army is." For Cunningham, the California bobsledder, the program makes being an Olympian possible. "Without the World Class Athlete Program, I would not be bobsledding still. I would be out of the sport easily four years ago, just 'cause of the financial commitment it takes," said Cunningham. "So to be able to have them as kind of a backing and their support for me and everything that the Army brings — it has been phenomenal." After Pyeongchang, Cunningham is not sure what's next: another Olympics, a career in the military — or something else out of the box. An earlier version of this story stated that active duty soldiers began competing in the Olympics after World War II. They began competing in 1912.